Choosing wine for your wedding can seem like an easy task, but not a task that should be left to the last minute. 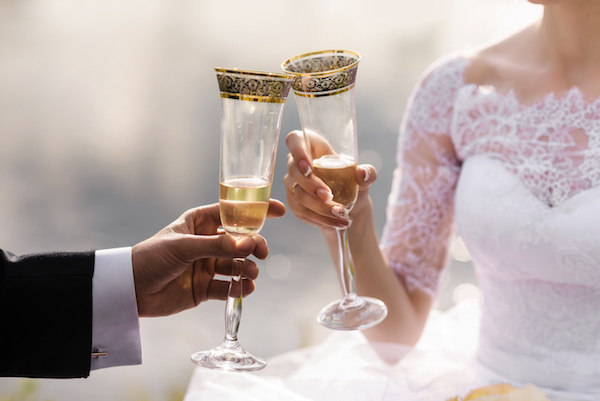 Since choosing the wine can be a challenge for some couples, here are some tips to help you make the right selections for your special day. The most important rule any time you are planning to add wine to an event is to drink and serve what you like. Remember this is your day and people are there to celebrate the two of you, so if there’s a wine you both enjoy and would like to share with others, this is a wonderful time to serve it. It can also be fun to share the story of why a certain wine is your favourite wine or how it works into the story of your relationship. If you’re planning to use a sparkling wine for your toast, there are many options that will fit any budget. A few favourites are Prosecco from Italy, Cava from Spain and Cremant from France. Cremant is made with the same method as Champagne but it cannot use the name as it is not made within the Champagne region. All of these bubbles are excellent values and will be delicious in your glass. Corkage is a term that describes an additional cost per bottle that a reception location may charge if you opt to bring your own wine rather than use a wine from their list. It’s important to understand how the fee will be charged. Will it be on all bottles purchased for the event or just those that are opened. If it’s on bottles opened then it’s important to make sure that your caterer and serving staff know not to open additional bottles until needed. One white and one red are really all you need. If you’d like to pair a different wine with every course for your wedding, it can most definitely be done, but offering one red and one white wine option is definitely the standard. Also, remember that just like your cake and your meal, you should make time to try the wine before you serve it on your wedding day. A general rule of thumb when purchasing wine in large quantities is to buy one 750 ml bottle each of red and white for every 10 guests. Note: A bottle of wine pours four to six glasses. Find a quiet moment somewhere in your day to share a glass of wine together to celebrate the new adventure.